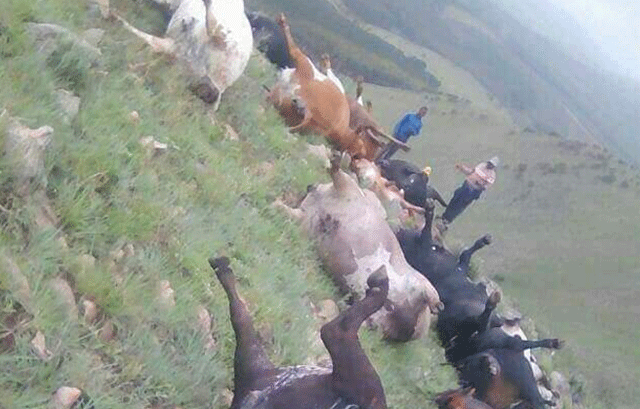 MINISTRY of Agriculture Director of Veterinary and Livestock Services Dr Xolani Dlamini says there were no reports of livestock that was killed by the tornado on Tuesday evening. He said the pictures circulating on social media looked like archived pictures of cattle that died at Mphisi farm in 2016, as a result of ingesting a consignment of poisonous bales of hay obtained from a farm in South Africa. He said some of the cattle that were affected were from as far as Nhlangano and had come for fattening purposes at the Mphisi farm. “If I look closely at the pictures circulated on social media, they reflect a case we once attended to at Mphisi, where about 60 cattle were killed by poisoned bales of hay that was bought in South Africa the previous years,” he said, adding that officers from the Vet office were assigned to Magcongco to verify the damage as it was reported in the local media but they came back with nothing. THE National Meteorological Department classified the weather event as that of a tornado. The storm was moving at more than 60 knots, which is around 80 km/hour. According to the forecaster, a tornado is a violent rotating column of air extending from a thunderstorm to the ground. “The most violent tornadoes are capable of tremendous destruction with wind speeds of up to 300 mph. They can destroy large buildings, uproot trees and hurl vehicles hundreds of yards,” said the forecaster. Furthermore, he added that during a tornado, less rain is usually recorded. Late last month, the NDMA reported that 79 homesteads were destroyed by storms in the Manzini and Lubombo regions. One of the storm victims, an elderly man of Timbutini, died from injuries he suffered when their house was destroyed by the storm travelling at an average speed of 80 km/hour. The devastating winds injured people causing damages to houses and infrastructure, including Sibetsaphi Police Post. A higher volume of affected households was seen at Mafutseni Inkhundla and recorded one fatality. Mtfongwaneni, Manzini South and Phondo Tinkhundla centres also reported some damages by the same storm. ABOUT 44 homesteads were left without shelter when the roofing of their houses was blown off by strong winds that swept across the country on Tuesday evening, leaving a trail of destruction. Homes were pounded in parts of the Hhohho and Manzini regions on Tuesday afternoon, leaving more or less 120 people without shelter. The heavy downpours, which were preceded by gusty winds, partly ripped off roofs and uprooted some trees at Montigny in Bhunya area. Traffic was also disrupted. For instance, motorists were stuck for some time in some areas of the country such as Bhunya, as the roads became inaccessible as a result of the debris lying on the roads. According to National Disaster Management Agency Commu-nications Manager Wandile Mavuso, in Northern Hhohho region there were two areas that were affected, Ntfonjeni and Timphisini. “At Ntfonjeni, there were six houses that had their roofing blown away, while at Timphisini there were 23,” he said. He said this affected four chiefdoms under the same constituency. Meanwhile, another affected area is Lundzi, an area around Bhunya under the Manzini region. Mavuso said in Lundzi there were 15 homesteads affected by the tornado-like storm. He said the Baphalali Swaziland Red Cross Society and NDMA community volunteers coordinated the rapid assessment exercise, adding that the victims were given relief material in the form of tarpaulins, tents and food parcels. “The abovementioned materials were provided to deserving households during the assessment,” he added. A higher volume of affected households was seen at Timphisini where only one fatality was recorded. He said the provision of relief assistance by the regional office was ongoing as some new reports were being received.